On July 14, 1974, The Kinks played a fantastic set at the Hippodrome in London, and you'll only hear it here. Did you know that Paste owns the world’s largest collection of live music recordings? It’s true! And what’s even crazier, it’s all free—hundreds of thousands of exclusive songs, concerts and videos that you can listen to and watch right here at Paste.com, from Muddy Waters to The Rolling Stones to R.E.M. to LCD Soundsystem. Every day, we’ll dig through the archive to find the coolest recording we have from that date in history. Enjoy! Today in the Paste Vault we find a vintage concert recording of British Invasion legends The Kinks playing a hometown show at the Hippodrome Theatre in London on July 14, 1974. 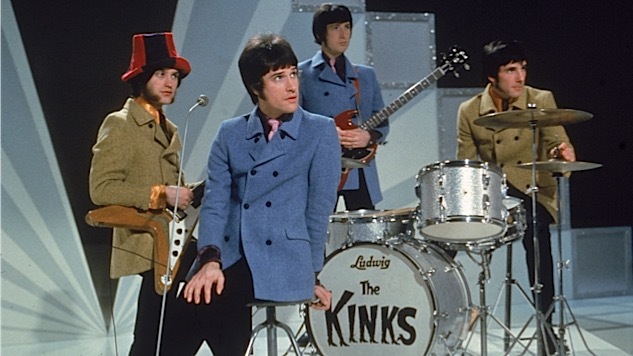 To capture the theatrical sound of the record, the Kinks added a horn section and backup singers to there stage show, becoming a powerful sonic machine in the process. Critics didn’t love the Preservation project, but the live renditions of the songs were undeniably great thanks to expanded lineup. To start, here’s a crystal clear performance of Preservation: Act 1 standout “Demolition,” a funky track made huge by the horns and backup singers that warrants rediscovery for all you classic-rock fans out there. Next comes the theatrical rocker “Here Comes Flash,” sung by Dave Davies along with backups Claire Hamill and Pamela Travis, about the opera’s nefarious central character. And then he’s gonna screw you up. Then he’s gonna cheat on you. Preservation was a heavy lift for many Kinks fans, so Ray and Dave included some undeniable crowdpleasers in their 1974 set. Here’s a playful version of “Dedicated Follower of Fashion,” from 1965’s Kinkdom. Ray asks the crowd to sing along as the song begins, and they more than oblige. And here’s a spot-on, hard-driving version of the radio staple “Lola,” from 1970’s Lola Versus Powerman and the Moneygoround, Part One, which gets a huge roar when announced. Some artists become victims of their own creativity, each work growing more complex in concept and execution until the burden is more than any one person can bear. Both Davies could be described this way, but they also managed to create one of the most astonishingly original and literate bodies of work in all of popular music.